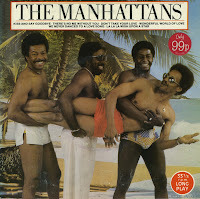 This six track EP of the Manhattans was released in 1983 by Pickwick International, a UK label specialising in re-releasing old material. 'Kiss and say goodbye', track one on this EP, is their best known hit, reaching number 4 in the UK singles chart and number 1 in the Dutch Top 40 in the summer of 1976. According to the blurb on the back sleeve of this EP, The Manhattans hail from the state of New Jersey and consist of Gerald Aiston, Ed Sonny, Bivins Jr., Kenny Kelly and Winfred Blue Lovett.